Matthew specialises in commercial law with a particular focus on commercial contractual disputes. Matthew also practices in the areas of property (retail leases), consumer, corporate, family, and equity law, wills and estates (family provision and probate), bankruptcy and insolvency, and administrative law. He also has experience regarding apprehended violence orders and driving offences and criminal matters. Matthew came to the Bar after working extensively in the property practice areas of property portfolio management and commercial property asset management in the United Kingdom and continental Europe. 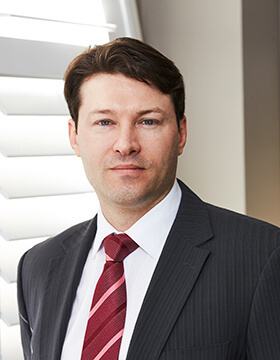 Matthew appears as counsel in all Australian courts and is available to assist with advice, representation and advocacy at any stage of the legal process. Matthew holds a Bachelor of International Studies from the University of New England, a Juris Doctor from the University of Technology, Sydney and a Master of Laws from the University of Sydney.